The Ardh Kumbh Mela is a fest that is celebrated for over a stretch of two long months, starting from the date of 5th January to 4th March in the city of Allahabad, Uttar Pradesh. The festival is celebrated with utmost zeal and enthusiasm and is held when the celestial setting of the stars are properly alligned: when Jupiter will be in Aries, the Sun and Moon in Capricorn; or Jupiter is in Taurus and the Sun in Capricorn. The Maha Kumbh Mela is celebrated once in every 12 years and the Ardh Kumbh Mela, which literally translates to 'Half Kumbh Mela', takes place once in every 6 years. 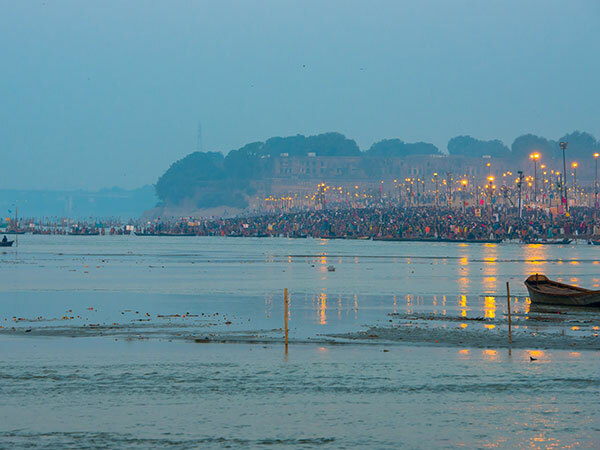 Allahabad, nestled on the banks of the confluence of the rivers Ganga, Yamuna, and Saraswati, is hosting this year's world's largest religious gathering and the preparations are on in full swing. The Ardh Kumb Mela of 2019 is in the city of Allahabad, formerly known as Prayagraj, which has also eventually grown up to be an important pilgrimage centre in the country. The city is a very busy and important tourist hub with its heritage architectural beauties and beautiful landscape. Apart from Allahabad, Kumbh Mela is also organised in Haridwar, Ujjain and Nasik. The history behind hosting this 55-day long elaborate affair of Kumbh Mela is that it is believed, according to Hindu mythology, during the 'Samudra Manthan', which means the churning of the 'Kshir Sagar', the ocean of milk, four drops of 'Amrit', the nectar of immortal life had fallen at Prayag, Haridwar, Ujjain and Nasik on earth where the kumbh mela is now organised. From the fragrance of thousands of incense sticks to the echoes of numerous Naga sadhus and Babas chanting prayers, the Ardh Kumbh Mela is likely to have a lot of new experiences for you to see and experience. This religious gathering, which is likely to be attented by 15 crore people, has been recognized by UNESCO as an Intangible Cultural Heritage, with rituals like taking a dip in the holy water at the confluence, which is considered to relieve a person from all their sins. The Mela certainly can be a sight to relish with the exquisite and joyous evening 'aartis' to the sight of bare body Naga Sadhus smeared with ash to take the royal bath. Apart from dips and large gatherings, the Ardh Kumbh Mela of 2019 offers a lot of activities and experiences to savour and here is a travel guide with a list of top attractions at the Ardh Kumbh Mela, that can help you prepare your to-do list and could interest and attract you a little more than the others. The Satsangs organised at the Ardh Kumbh Mela form a very important part of the celebrations. Devotees gather around to sit and listen for hours to the important and meaningful preachings of the spiritualist sadhus and sages. Arrangements of a number of ashrams and halls are made, where people can go and offer their prayers. You can go and listen to the preachings of spiritualist priests and saints, on what are their ideals of Hinduism and spiritualism. Attending the Kumbh Mela is really fun and can amount to a lot of new experiences to live through and incredible sights to behold, and when it comes to accomodation, staying in camps and spending the night under the stars is something that can give you memories for a lifetime. The camps are primarily set up for the sadhus and babas, as they prefer staying near the ghats, where the bathing rituals are carried out. They are all set up just within a few kilometre's range from the ghats. Living in these tents, during the fair, give you the joy of experiencing new cultures and interacting with people from different regions, a little peek into knowing their lifestyles and many other things. Due its popularity worldwide, the Kumbh Mela organizers have arranged special camps for the international travellers, so that they can indulge in that authentic feel of the Kumbh Mela. The Kumbh Mela Langar is something that you would not want to miss, as it is the most coveted attraction of this 55-day long extravaganza. Langar is usually a communal meal arranged for all the visitors and devotees attending the Mela. The sacred offerings are served in the form of meals in the community area of the Mela and here people enjoy the mouth-watering bites of the langar offered to them free of cost. Soak in the madness of this elaborate extravaganza and indulge in the lip-smacking offerings of the langar.